The name Chuck Jones is one that perhaps failed to capture the notoriety in racing that other car owners and managers have enjoyed in the past, but Chuck’s amazing story is one well worth telling. Chuck Jones was raised in Southern California in the 1940s and came of age in the immortal post war era of hot rods and specials. Jones set his sights on Formula 1 at a young age, and worked tirelessly to reach his goal; passing through the ranks of the USRRC, F5000, and finally on to Team Ensign in 1975. Recently we had the chance to talk with Chuck, now 80 years young and residing in Florida with his children and grand children close by. The interview is what could only be described as a brief recap of a career that saw interaction with some of the world’s top racing drivers. Drivers like Ickx, Regazzoni, Piquet, and many other notable names were all helped along by Chuck at different points in their professional careers. Sports Car Digest: How did you get interested in motor racing? Chuck Jones: I grew up on a rather large cattle ranch in Southern California, and when cars came in I went bananas. I went to the library and took out a book called “Motor Racing with Mercedes Benz” by George Monkhouse which was about the 1937 Grand Prix season with Auto Union, Mercedes, Alfa and the others. That absolutely stuck under my skin. I met Monkhouse 20 some odd years ago and was able to tell him my little story which he enjoyed. In a strange kind of way I just had this dream of making it to Formula One, and it took me 25 or 30 years but I finally made it as Mo Nunn’s partner in Ensign. 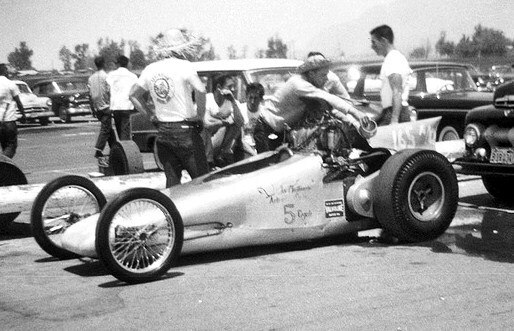 I entered my first drag race in 1950, at Santa Ana, and took home a trophy. Growing up in Southern California in the ‘40s was almost like starting out at a football game 3 touchdowns ahead. The war surplus stores were there and things were unbelievably cheap. All you had to have was just a job and want to do something. I pinstriped cars; I was single with a good base at home. My family was well off, but yet I had to work, I mean we worked our tails off! But it was the right place to be at the right time. SCD: You knew Ak Miller, how did that come about? CJ: I helped Ak Miller in 1957 with the car that they took to the Mille Miglia and accompanied it and crewed it. I use to be the editor of Drag News back in the ‘50s though I’m not a journalist or a writer, it was just that Chet Herbert was my sponsor in drag racing and had bought Drag News and I had the time and lived near him. 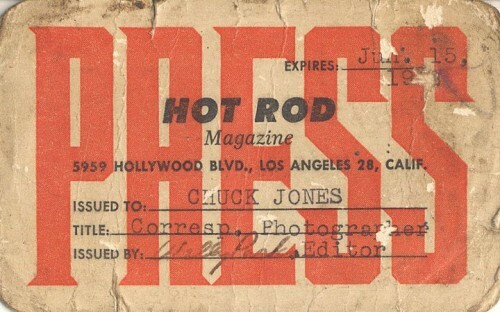 When I went to the Mille Miglia, I was given journalist credentials by Hot Rod magazine, and I still have the damn thing. I think I was their first overseas journalist and I still laugh at it. I was invited to Monte Carlo by the BRM Team and was introduced in a manner that I’ll never forget, treated very nicely, and met all the top drivers. One of my first drag racing partners was a young guy up in Whittier by the name of Walt Sandoval, and he and I met at I think Long Beach, at Lyons Dragstrip. I was running a ’32 Coupe and Walt was running a C Altered and we met, liked each other, and decided to join forces. We then became national champions in C Altered and D Altered and held a number of records. Chet Herbert was my early sponsor and I ran a nasty lil’ Dodge which he liked and he ground me a wild roller tappet cam that was so severe, and I’m not lying to you, that every other run we had to pull the tappet covers and put in new push rods. Believe it or not, that after a few weeks I got so good at feeling the clearance, I didn’t have to use the 16 or 18 thousandth feeler gauge anymore, that’s how constant they went. I came up with the 1320 Challenge in Drag News where we highlighted whatever division or class it was that was setting a course record and Walt and I frankly held a number of those records over that time. Then Chrisman and I got together and I owned the Sidewinder dragster, a chain driven car, we literally ruled the West Coast over the years with just a big go-kart a a 440 cubic inch Chrysler and 6-71 blower. It was more commonly known as the Chrisman, Mallard, Reed, and Jones car. We could run a much shorter gear and had better traction than anybody else. That’s what it was all about anyway. I wanted to be in road racing though; drag racing was a good way of staying involved [in motorsport]. SCD: Did you race in Europe in the late 1950s? CJ: No, apparently there was another Chuck Jones that did, but I didn’t make it back to Europe for quite a few years. I joined up with Skip Hudson in the early 1960s and did some racing in North America. Skip was rather talented. 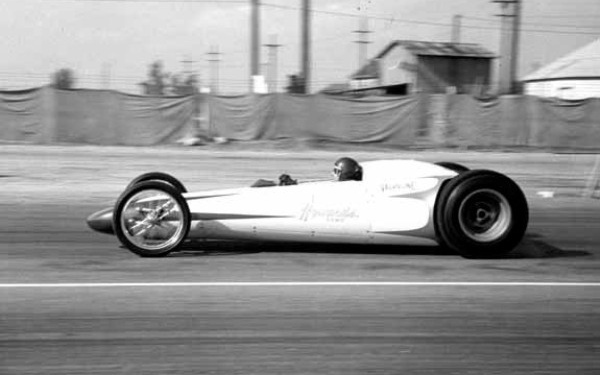 He was Dan Gurney’s close friend, they grew up together at Riverside and went to the dry lakes together and started racing together. Skip had immense talent, and he and I first went together and bought one of the ex-Cunningham 151 Maseratis and we had a fair amount of success with it. For somebody that didn’t know anything about road racing at the time, I was learning on the curve. 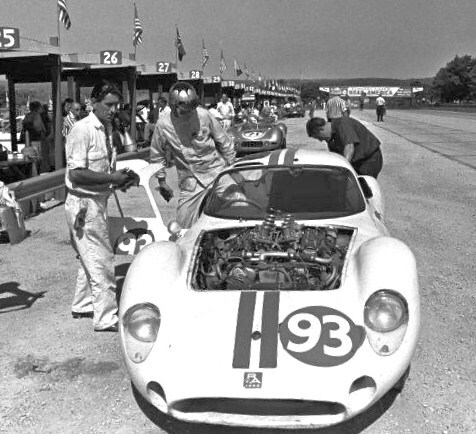 We had a very good run at the 500 mile race in 1963 at Elkhart Lake. The car wasn’t really up to those of the other machines at the time that had come over, especially the Cunningham Jaguars. The only thing was that we had done some of the set up for one of the NASCAR drivers at Riverside and they left their quick fill fuel cans. We were the only ones at Elkhart Lake that had them and our pit stops were blisteringly quick. That helped make up time on the track. So we learned as we went. Thanks for bringing light upon Chuck Jones, a man who has been there and done that. Imagine covering the Mille Miglia for Hot Rod magazine! What a hysterical concept. Thanks. Chuck Jones story is a fascinating bit of racing history. He is an original out of southern Calofornia and he was in the right era to accomplish what he did. Chuck, thanks for sharing your memories. Wil: You have a typo on page 2 of your Chuck Jones interview, it isn’t Jerry Entin with Chuck Jones it is Jerry Eisert, his racing partner. Otherwise very nice article. Thank you for the correction Jerry. We’ve made the update. Beautiful read, there is one correction. It was Jerry Eisert, not Jerry Entin. Thank you, Lorrie Eisert. Happy to here from you Gerry My e-mail is: f1cj22@gmail.com Janet and Sean and Stephanie say Hello! Today Chuck Jones made my day. I had the opportunity to meet Chuck for the very first time in my life. I work at the Tampa airport and mr 81 year old Chuck was checking in to Ct. He was on his way up north to a museum for formula one race cars. He was full of energy and gusto as he confirmed his history to me in a matter of 20 minutes. He is a truly proud Grandpa for his grandsons who both fight professionally. Justin you make him PROUD!!! Will, I knew Chuck and his son, Sean in Tustin, California in the 1980s. I would love to know what has happened to him, Sean, and his daughter (whose name I cannot remember). His daughter had her baby boy when I was their upstairs neighbor in Tustin. I have many memories of Chuck and Sean, their Ferrari, and Sean’s help in my move to Northern California in 1990. I would love to hear from any of them, and hope you will pass along my contact information if that is possible. Thanks for your help. I grew up down the street from Chuck in Santa Ana in the 60’s. It was great fun for a teenaged car nut. He let me hang around and be one of his shop gophor (go for this, go for that). I turned 16 in 1966, on my birthday got my licence to drive. I must have had a big grin on my face when I went over to see Chuck, he handed the keys for his 289 cobra, and said lets go for a ride. How cool was that? It is good to her he is doing well.